On my daily walk to work, I come across a string of bus stop benches, decked out in advertisements of local realtors. The ads are usually just a shot of the person's head, enlarged 3.5x with cheesy slogans. Anyways, the routine of the week goes like this: on Sunday evening, someone will graffiti the signs with spray paint and markers, and on Friday afternoon, someone else cleans it off. The graffiti will consist of anything from tags to racial slurs to hitler moustaches drawn on. Graffiti is one of those taboo topics that generally gets labeled as bad. When you drive into a big city, the best reaction to provide by driving past graffiti-ed trains is "that's horrible! who, on God's green earth, would do such a thing!?!" But, I can't help but be fascinated by it. 2 other forms of graffiti that I've come across lately are yarn bombing and seed bombing. 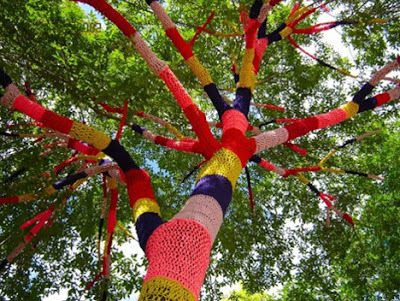 In yarn bombing a group or individual will get together and knit/crochet a large covering to wrap around a large monument or item. This tree will be warm and snug come winter! 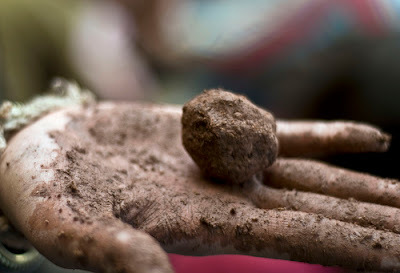 In seed bombing, a individual will hurl balls of soil compacted with seeds all over a city- or in areas lacking vegetation. It's like a green-graffiti-anarchy-sort-of-thing. What makes yarn bombing more acceptable than seed bombing, which is more acceptable than spray paint graffiti? And, if you too are in a journey to make spaces beautiful as well, how do you differentiate? It's a pretty slippery slope (and I'm halfway down the hill with no skis on!). I guess I'm wondering if you can accept one without accepting all of them. Sorry for being political and such. Regular non-politcal-decorator-Steve will be back tomorrow, I promise- hopefully with a new project to show off!